The Woods are saved — Happy Holidays! It is with great pride that we announce that the Canco Woods property has closed and all documents have been recorded at the registry – the land is preserved! As announced in a press release on Friday, The Trust for Public Land bought the property from the Iberdrola USA Foundation (parent company of Central ME Power) and conveyed the property to the City of Portland subject to a conservation easement to be held by Portland Trails. We have raised the amount necessary to close on the property by the deadline, however, we still do have to complete the fundraising, as a portion of the money we’re raising is to be used for stewardship of the land. Portland Trails is the Woods’ easement holder and the money will be placed in trust for them to use to take care of the Woods. So please help us to finish the campaign and raise the final $10,000. And finally, eternal thanks to everyone who donated, and put countless hours of time into preserving these woods! From all the friends and neighbors who gave anywhere from $10 to thousands, to the Trust for Public Land (without whom we couldn’t have done this), to the City of Portland’s Land Bank and City Council, especially Cheryl Leeman, to the folks at Central Maine Power/Iberdrola whose final gift made this possible, and to Portland Trails who will steward the land in the future – we all owe them our thanks! And if you would like to keep abreast of what’s going on with the Woods, you can “like” us on Facebook or follow us here. Have a very Merry Christmas and a Happy New Year, and we hope to see you out enjoying the Woods! 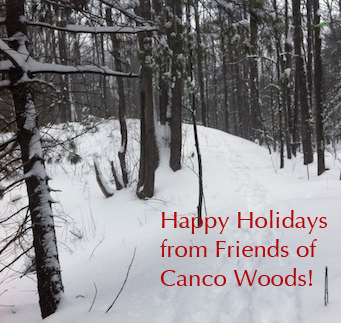 Friends of Canco Woods > Breaking News > The Woods are saved — Happy Holidays!